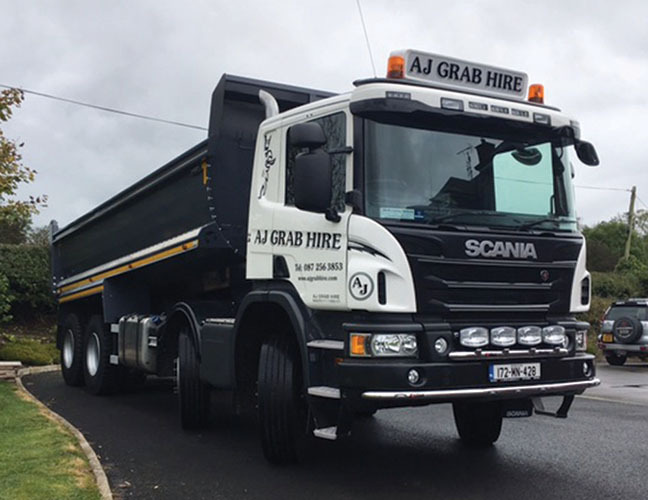 At Monaghan-based AJ Grab Hire, they take great pride in their modern fleet of heavy haulage vehicles plus heavy plant and machinery. They are also committed to supplying their customers with the highest possibl quality of services. Providing nationwide grab hire services to remove muck, topsoil, demolitions, construction waste, sand and gravel from both commercial and private sites, no job is too big or small as far as AJ Grab Hire is concerned. They can also help when it comes to clearing a site, landscaping or just removing large amounts of waste. C2 registered, AJ Grab Hire are fully licensed and insured while all of their drivers are insured and all hold a current safe pass certificate. They are also permit holders to work with all utilities including gas, ESB and water and the company also carries all the relevant waste licences for all regions. The family-run business was established by Barry Nugent and his wife Siobhan in March, 2006 but it can trace its roots back further than that. Since then AJ Grab Hire has gained a reputation for delivering high quality work and their growth has been driven by repeat orders from existing clients, demonstrating their level of confidence in the ability of AJ Grab Hire. They always approach each project carefully ensuring that all work is carried out efficiently with due thought and regard for the surrounding area. Typically, carrying out work on behalf of large utility companies and private individuals, they always have the right truck and right equipment on hand at the right time. Put simply, they are ready to get to work. Removal and disposal of waste is an important part of each project and dealt with by a professional workforce that makes sure that your site clearance is carried out quickly and efficiently to your specific requirements. Not content to rest on their laurels, they constantly strive to expand and improve their services. Customer service is a cornerstone on which their day-to-day approach to business is built while they also pursue a policy of continuous investment in upgrading and maintaining their fleet to ensure it is pristine condition. For example, they recently took delivery of a new Scania P410 complete with Gleeson Body and lots of extras including: reverse camera, auto greaser, bars, extra work lamps and strobes. Barry’s teenage son Joe has inherited his father’s passion for trucks and machinery and takes great pride in their appearance and making sure they are all in good working order. He is always keen to lend a helping hand around AJ Grab Hire’s modern workshop and all fleet maintenance and servicing is carried out in-house. “We’re not as busy as we were but we’re kept tipping away,” Barry revealed. Do you need your land prepared for a construction or landscaping project or perhaps you are approaching the completion of your project and require the site to be cleared of construction waste and made ready for your external finishes to be applied? Contact AJ Grab Hire today for hassle free site preparation and excavation services. They boast over 20 years’ experience in the sector and can be trusted to provide you with a professional service at a competitive price. For a no obligation quote call 042 97 45734 / 087 256 3853.